We’re changing the way you fix decking…how much time will you save? Did you know that there is a more efficient and seamless way to fix your decking – and it’s faster and easier than ever before? Check out CAMO today! WHY USE CAMO EDGE DECKING FASTENERS? You'll need a CAMO Marksman Pro tool, CAMO fasteners and the right size of CAMO driver bit to use with your drill. That’s all. The CAMO Marksman Pro slots onto each decking board above each joist. 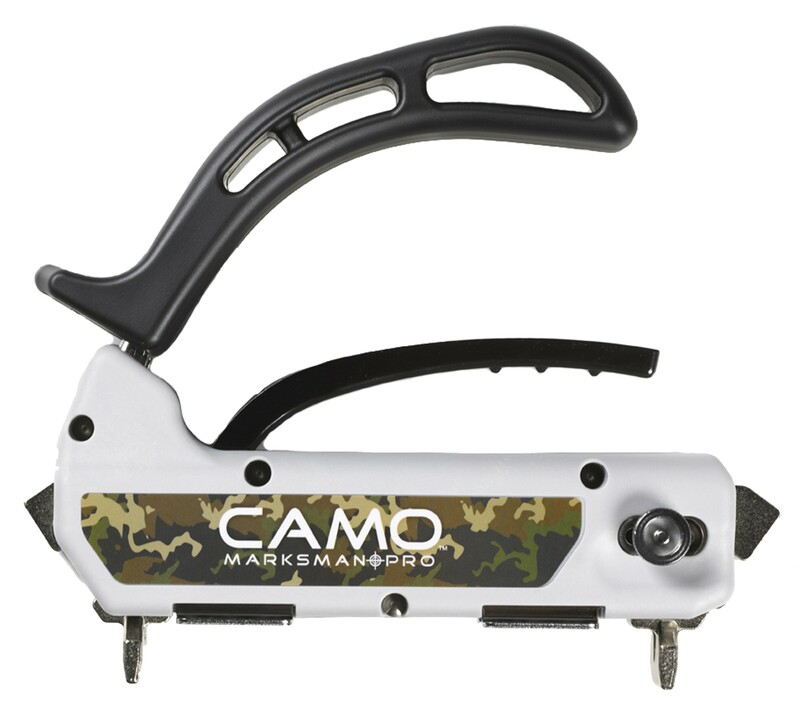 With a quick squeeze and release of the handle, you’ll lock the Marksman Pro to the board. Spacer guarantee you maintain the ideal gap between boards and ensure all boards are in perfect alignment. What Makes the CAMO System So Special? 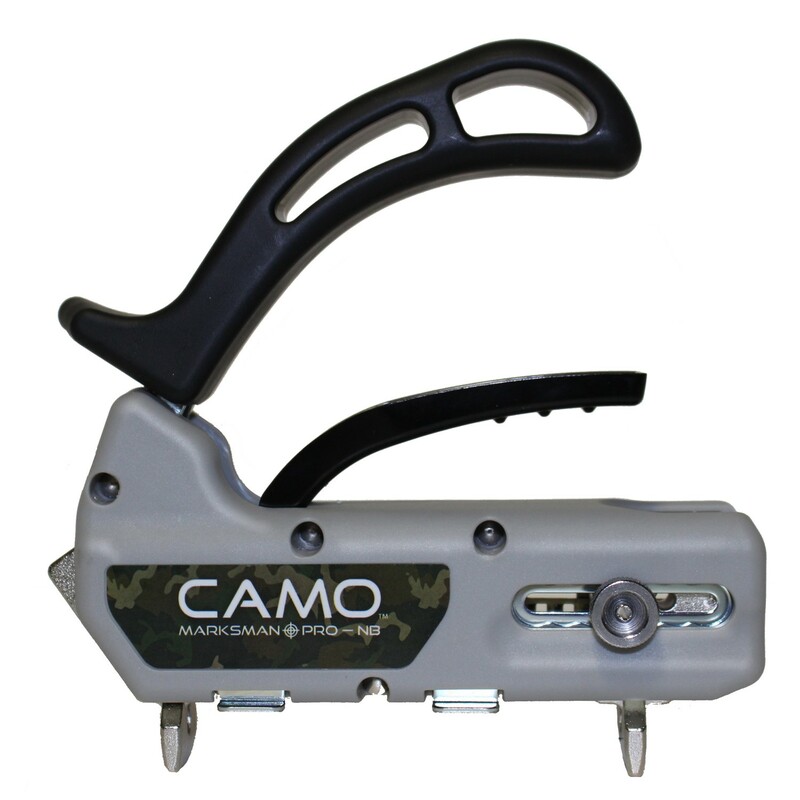 There are several hidden fastening systems on the market, but none match CAMO for precision, ease of use and speed. It’s quite simply the fastest and easiest way to ensure your decking projects are millimetre-perfect and look fantastic; and it’s only available to buy from OSC Sales. You'll need a CAMO Marksman Pro tool, CAMO fasteners and the right size of CAMO driver bit to use with your drill. That’s all. There are no extra clips to buy and install, and if a board needs to be removed for whatever reason it can be done with the minimum of fuss. The system works with treated wood, hardwood, cedar, PVC and composite decking, and the whole system is simply a joy to use. Once you’ve used it, you’ll wonder how you ever installed decking without it. Once you’ve got your board flush against the spacer, simply load the hidden decking screws into the angled guide holes and drill them into place. The special jig will ensure that the screw is driven to the correct depth every time, with no guesswork involved. The special decking screws have a “reverse rake” tip that removes wood as it’s driven in, which helps to prevent build up under the screw head and reduces the risk of the screw splitting the board when it’s close to the edge. The screws also feature a special thread design which finishes halfway up the shaft, which helps to pull the deck boards tight against the joist. Want to find out more about the innovative CAMO screws? We’ve assembled a list of frequently asked questions. If you’d like more information on our screws, get in touch with us on 08452419862. Securing timber decking boards can be a time-consuming process. Whilst traditional methods work, the CAMO Edge Decking System revolutionises the way in which you fix timbers. The CAMO Marksman Pro slots onto each decking board above each joist. With a quick squeeze and release of the handle you’ll lock the Marksman Pro to the board. Spacer teeth guarantee you maintain the ideal gap between boards and ensure all boards are in perfect alignment. Then attach your CAMO drive bit to your drill, load the CAMO decking screws into the Marksman Pro guide-holes on each side of the tool, and drill them into place. That’s it. Move on and secure the board to the next joist. Will screw heads be visible? No – That’s one of the great things about CAMO fasteners, once they have been secured to the decking, no screw heads will be visible creating a completely seamless decking system. What applications can I use these screws for? CAMO Edge Deck Fastening System is used solely for decking projects. Where can I buy the drive bit? There is no need to buy the drive bit separately. With each CAMO deck screw purchase, you’ll receive a free drive bit in every pack. Saving you time and money. If you need to purchase additional drive bits or any other of our products, please do get in touch with us. We have been the exclusive UK importer and distributor of CAMO fasteners since 2013. We have tried and tested them for you over the past 5 years, so we can answer any questions you might have.